I love the new range of Vintage Inspired Disney products from Primark. Their range includes some gorgeous homeware products and clothing. Recently, their Beauty and the Beast products have been so popular many shops have sold out! I’m still on the look out for a cute ‘Chip’ mug and ‘Mrs Potts’ teapot. They also have really pretty Beauty and the Beast bedding which the girls would love. I bought this lovely Bambi Mug for just £5. It would make a great Christmas present or birthday gift for any Disney fan! 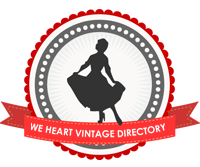 Hi, my name is Adele and I love all things vintage. My blog is somewhere for me to post all the beautiful vintage images and inspirations I find when I'm out and about or when browsing my absolute favourite site Pinterest! I have recently become a new mum to baby Lucy (hence blog title) and am now loving all the gorgeous vintage baby clothes and accessories you can buy. My blog also includes vintage fashion and beauty, home and wedding ideas, as well as my new hobby making vintage crafts. I really hope you enjoy following my blog.